The Scientific Publications Division of the Institute of Aviation has published the 43th issue of the Scientific Library of the Institute of Aviation series. 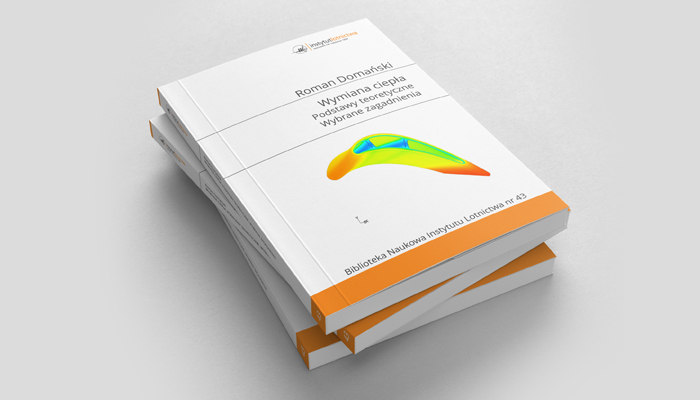 We invite you to purchase the book by professor Roman Domański “Heat transfer. Theoretical basis. Selected issues”. Lectures from the heat transfer are carried out in very different ways and cover a very wide range of topics. The series of supporting materials, scripts and books, including those supplemented with computer-aided learning process, were prepared as part of the work at the Department of Mechanics, Energy and Aeronautical Engineering at Warsaw University of Technology. The establishment of the new Center for Transport and Energy Conversion at the Institute of Aviation has been an inspiration for the preparation of new aid for teaching about Heat Transfer. The basis of the lecture is a Power Point presentation with recorded comments. In this way, the lecture becomes more dynamic and comments allow for a significant expansion of messages shown on the screen. There are many studies on the processes of heat transfer on the market, and the presented lecture enables quick familiarization with processes of heat transfer. The presented lecture is divided into two main parts. The first one covers basic information of the processes on heat transfer, along with verbal comments that emphasize physical phenomena and their parameters. The second part of the lectures includes two selected areas of energy transport on the heat way, namely the effects of laser radiation on solid objects as well as issues of cooling turbine blades and turbine engines. Both of these areas are discussed in more detail together with the presentation of selected results. These issues were chosen not at random – they are of great practical importance and the processes taking place within them are very complex and are the subject of ongoing research at leading research and industrial centers in the world. Printed materials, including all presented slides, and an audio CD, which includes presentations with commentary, are available. The reader can choose a specific lecture and run it on their computer. The book can be purchased in the on-line shop at this address.